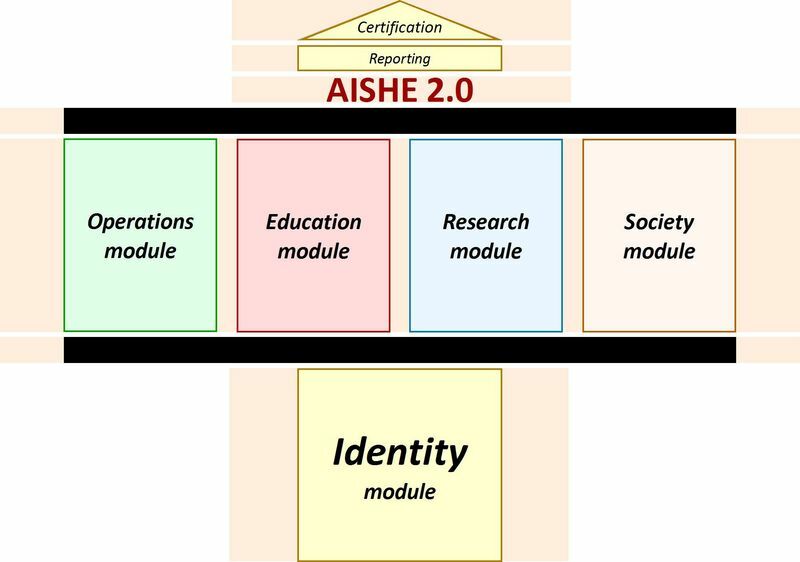 AISHE, the “Assessment Instrument for Sustainability in Higher Education”, was developed and validated in the Netherlands in 2000-2001 by DHO, the Dutch Foundation for Sustainable Higher Education. With the help of AISHE results, universities or their departments can be awarded the ‘Certificate of Sustainable Higher Education’, which is a star system, enabling universities to acquire 1, 2, 3 or 4 stars. AISHE can be applied freely by any university, but certified AISHE assessors are available to assist universities with the application. In the latest years, a new version, ‘AISHE 2’, was developed by an international group of universities and institutions (Netherlands, Sweden, Austria, Spain). AISHE 2 has a modular structure. The five modules are: Identity, Education, Research, Operations, and Societal Outreach. Each module consists of six indicators, that all are assessed making use of a five point scale derived from the EFQM approach to quality management, indicating the level of organizational development. Remarkable characteristics of AISHE, in comparison with other assessment tools of ESD, are: it involves a group of people, that together are representative for the management, the educating and the non-educating staff, the students, and the professional field. Together they seek consensus on the present state of the university concerning ESD, and about the desired developments in the next years. The result is of an intersubjective nature. This implies that AISHE is not only an assessment instrument, but primarily a strategy and policy instrument. An assessment is done by a group of about 15 people, and takes about one day. No preparations are necessary (apart from inviting the right persons and booking a room). The assessment report is ready at the end of the day. Repeated applications of AISHE will lead to "SISD”: “System Integration of Sustainable Development”. Case studies are available. AISHE has been applied hundreds of times in at least eleven countries. The developers of AISHE 2, who are experienced international ESD consultants, are prepared to assist you in applying the instrument. Universities that wish so, can contact the coordinator, Niko Roorda. If you want to apply AISHE 2 without help, you can download the manual and do as you like, without any charge. Assistance can be offered through email or telephone, in most cases for free, unless the assistance is very time-consuming. In that case, it is recommended to invite a certified AISHE assessor to lead the assessment, which means that you still don’t pay for the use of the instrument, but only for the time and travelling costs of the assessor.